Optigo’s ONS-S2 Smart Aggregation Switch create a flexible and efficient building network that fits any Smart building foot print. The switch aggregates traffic from Edge Switches to connect building automation and security devices to their management systems and servers through the building’s fiber-optic backbone. Optigo’ ONS-S2 is a purpose-built OLT, capturing all the benefits of Passive Optical Networking in an appropriate form factor. Its intuitive OneView Interface allows the entire network to be monitored and managed in a single graphical view. Small. Light. Low Power. 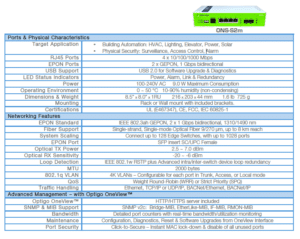 – Wallmountable GEPON OLT designed specifically for Intelligent Buildings. Centrally manage your entire network with built-in OneView™ Dashboard – web-hosted directly on the switch.